The loss of a child is an unimaginable, unspeakable horror. And it is said that the loss of a child is the most profoundly traumatic experience a couple can ever endure. Some are fused ever closer by it, symbiotically locked in the nightmare of a grief they cannot voice. While others are irrevocably destroyed, by a wound of suffering so immense it can never be cauterized. Grief can induce a sort of madness. It can feel like a loss of control, a spiraling. The loss of a loved one changes our picture of the world and where we see ourselves positioned in it. And it’s often entwined with guilt; guilt at having survived, guilt at still living, guilt that has no logic. Grief is an incoherent, emotional upheaval, for which there are few adequate coping strategies. For the most part, culture continues to demand stoicism, asking us to deal with our grief rationally, to shut it down, to go numb, to let it go, in order to keep moving forward. In his adaptation of Macbeth, Australian filmmaker Justin Kurzel (Snowtown, 2011), explores the complexity of this distress, within the parameters of Shakespeare’s original play. In Kurzel’s film, the unnatural death of a child is repositioned as the origin myth of evil and the primary cause of upheaval in the play’s moral universe. From the beginning, Macbeth (Michael Fassbender) and Lady Macbeth (Marion Cotillard) are descending into hell. Kurzel opens the film with a stark, wordless sequence. Out on a desolate heath we see Macbeth and Lady Macbeth preparing to burn their young son upon a funeral pyre. In this brief, but integral scene, we come to understand both the intensity of their bond and the roots of their madness. This child’s death has disrupted the natural order of their world in the most extreme way. All that happens next – the murder of Duncan, King of Scotland, the murders of Banquo, Lady Macduff and her children – emanates from this wound as an expression of the blackness of their grief. The Macbeths are not driven to madness because of these unnatural acts; the madness was already there. The Macbeths are cemented to each other, in mourning and in blood. Of course this scene does not appear at the start of, or anywhere for that matter, within the pages of Shakespeare’s play, which begins instead with thunder and lightning and the entry of the Three Witches. The funeral is purely an imagining of the film’s screenwriting team – Tom Louiso, Jacob Koskoff and Michael Lesslie – but there are certainly clues within Shakespeare’s text that something is wrong, that a prolonged period of mourning has shaped the Macbeths’ life. Later in the text, when Lady Macbeth attacks her husband’s milky manhood, she talks of knowing “How tender ‘tis to love the babe that milks me …” That child (or children) is now conspicuously absent from the play. We assume, from all the subtleties of Shakespeare’s prose, that this child has died, without it being explicitly stated. Kurzel’s Macbeth excavates a truth slightly buried and makes it visual. Throughout, Kurzel opens the play, expanding its borders. The original text is trimmed and revised in parts. Donalblane is omitted, as is “double double toil and trouble,” and the comic interlude with the porter. Wordless scenes remove any sense of staginess, elongate the action, and heighten moments of pure cinema. The sparseness certainly doesn’t suggest that something significant is missing at any time. Kurzel’s vision of Shakespeare’s text requires these amendments. The comedy of the porter, for example, could only be anathema to this intensity. Kurzel emphasises the bloody viscera of grief through a number of significant choices. Grief has a metaphysical component, entangled with guilt. In the famous “Is this dagger which I see before me” scene, a bold juxtaposition adds weight to this connection. Rather than the dagger appear before Macbeth, apparition-like, a young boy, who has died in the film’s extraordinary opening battle scene, delivers it to him. This vision of the young boy soldier reappears throughout the film, a recurring symbol of Macbeth’s guilt, enveloped in the grief of the loss of his actual son. Grief has no end and here Kurzel chooses to have Lady Macbeth bear witness to the death of Lady Macduff and her babes. Here, she is made to suffer, on her knees, penitent for the loss of her own child and for the violence about to be committed in which she plays a major part. It’s a harrowing scene, resolute in Cotillard’s wonderfully expressive face. 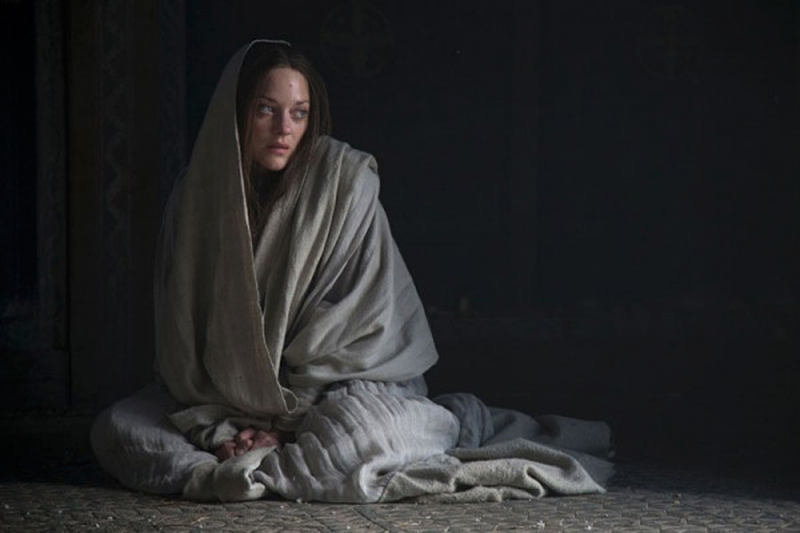 But in no scene is this desperate entanglement of guilt and mourning more profoundly rendered than in Kurzel’s treatment of Lady Macbeth’s final soliloquy in which she asks, “What, will these hands ne’er be clean?” Kurzel removes the Gentlewoman and Doctor from the scene and leaves Lady Macbeth seemingly alone. All hope is lost as she realises that “All the perfumes of Arabia will not sweeten this little hand.” But Kurzel shifts the camera by scene’s end to reveal a small boy we assume to be the Macbeths’ now dead son, sitting before her, alive once more in her mania. She has been addressing him, as the figure of both her guilt and grief. And before his body, she surrenders, and is swallowed whole by both. 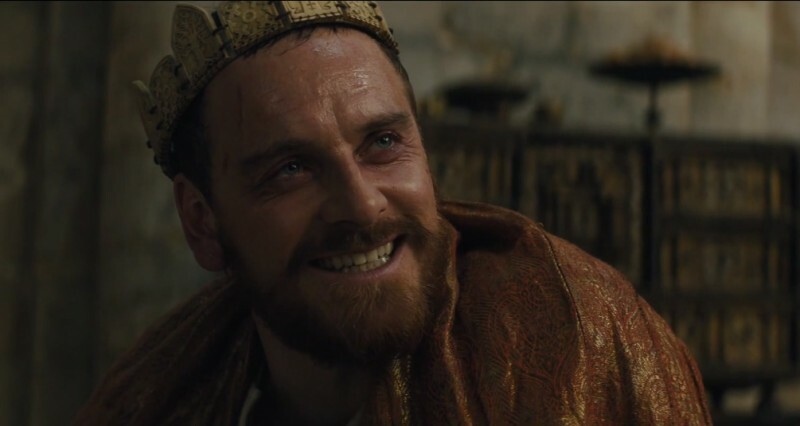 Kurzel’s Macbeth is a viscerally intense viewing experience, a film of blood and guts and mud. But it also pulsates with the intensity of loss, as a psychological framework from which his characters cannot escape. Grief bubbles under the surface of all the film’s action, incurable and deadly.